Wash and cut the potatoes into 2 or 4 pieces depending on the size. Place in oven – if you have a steam combined oven cook for 25 minutes on 200 degrees, or 45 minutes in a non steam oven. Alternatively you can steam the potatoes in their skins, which will take approx 20 minutes. Mix mackerel, watercress, cranberries, oils (keep some back), vinegar, Tamari and black pepper in a bowel. 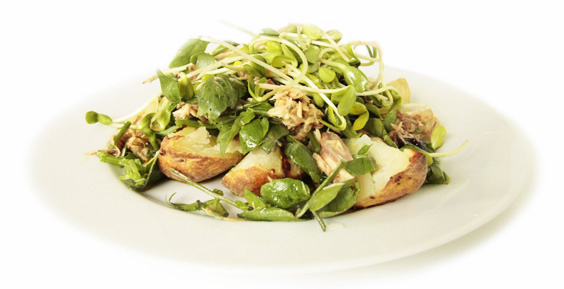 When potatoes are soft all the way through, place them on a plate and pour over the remaining oil, then place the mackerel and watercress mixture over potatoes and place the sunflower shoots on top. This is a delicious easy to make lunch or dinner that is highly nutritious, high in excellent essential fatty acids like Omega3 and Monounsaturated fats, protein, fibre and antioxidants. This will fill you up without making you feel ‘stuffed’, and keep up your energy levels. It can be taken to work as a cold potato salad.